Hop on a magic carpet and fly to Qasr Al Sarab Desert Resort by Anantara, opening this winter in the Liwa Desert, 90 minutes outside of the U.A.E.’s capital city of Abu Dhabi. A desert lover’s paradise, the Liwa is part of the world’s largest uninterrupted desert known as the Rub’-al-Khali (Empty Quarter). Spanning four Arab states, the Empty Quarter boasts some of the world’s oldest trade routes, towering dunes, and ancient cities buried in sand. Adventurers and thrill-seekers will love the Desert Excursion Center, where they can try sandboarding on dunes, off-roading in a 4×4, camel trekking, or falconry. The 206-room resort features rooms, suites, and villas outfitted in sumptuous Arabian décor and modern furnishings. The three onsite restaurants will tantalize with regional classics and international favorites, served with a Middle Eastern twist. To escape the heat of the desert sun, chill out at the Anantara Spa’s marble hammam. Need more reason to go to Abu Dhabi? Check out the international Date Festival held in July for some of the country’s regional fruit specialties, or climb, hike, and paddle your way through the Emirate this December at the annual Adventure Challenge. And for those who don’t have a magic carpet, Etihad Airways is offering direct service to Abu Dhabi International from three North American gateways (New York, Toronto, and Chicago). A keen ear and an ability to talk to anyone has served Joe Gomes well over the years at Park Hyatt Toronto – 50 years to be exact. That’s how long he has been behind the bar at the hotel’s Roof Lounge. Built in the 1940′s, the Roof Lounge was the second bar in the city to receive a cocktail license. The deep suede wall coverings, rich leathers, fireplace, and faint jazz soundtrack give it a 1950′s Rat Pack vibe. 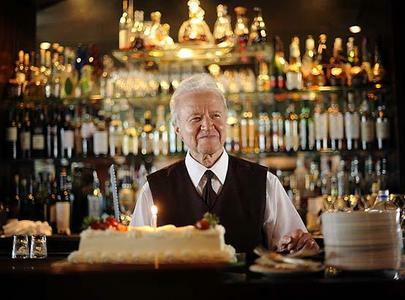 Over the years, Joe has shaken and stirred his renowned martinis for famed guests like Jane Russell, John Wayne, and even the Queen. He admits to the Globe and Mail that part of being a bartender is being a psychologist. He often takes the glass is half-full approach, asking what is there really to complain about? “You’re here enjoying your drink. The bar is filled with good people. How bad can things really be?” Joe still works the 5pm-2am shift with no plans of quitting anytime soon. Talk about stamina, this September will be his 34th year serving celebs and industry giants at the parties that overtake the roof top during the Toronto International Film Festival. Get an inside peek at Joe’s life behind the bar here. The Peninsula New York is rewarding travelers opting for an urban vacation over a beach getaway with the “Value your Weekend” package. 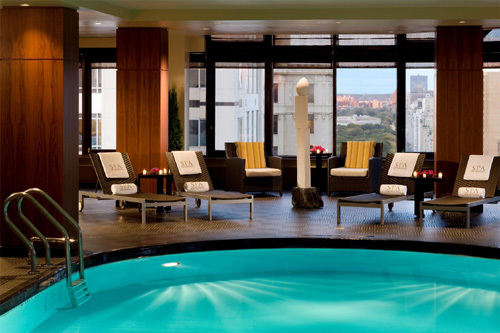 Starting at the impressive rate of $495 per night (that’s over 50% off of normal rates), the package includes complimentary breakfast (in-room or at Fives Restaurant),daily newspaper, Wi-Fi, and a 60-minute spa treatment (typically priced at around $195) at the shiny new Peninsula Spa by ESPA. So forget the Hampton Jitney and “feel” the escape with a treatment of choice in the new Peninsula Spa by ESPA. And remember to pack that bathing suit; the Peninsula has a glass-enclosed swimming pool and sundeck for dipping and lounging. Not quite cool enough? Enjoy a splash from the stunning ice fountain to chill out during the summer heat. More information can be found here, and by clicking on the “Value Your Weekend” tab. As part of Crystal Cruises’ “Crystal Clean” program that supports environmentally-friendly initiatives, the cruise line has outfitted all of its guest room closets with EcoHangers. Made from 100% recycled paper, EcoHangers are recyclable and a more environmentally sound alternative to conventional wire and plastic hangers. To take this “green” laundry practice a step further, the cruise line is using washable garment bags for laundry distribution, eliminating the use of more than 100,000 plastic bags on its ships per year. While everyone else has been busy chattering about the midnight Harry Potter premieres, we have been prepping for our own premiere: Rosewood Maykobá, The Movie. The video is just a quick seven-minute sneak peek at a Riviera Mayan vacation à la Rosewood Hotels & Resorts. Enjoy! This summer, stay for $395 per night, which includes breakfast for two daily, $200 resort credit per stay, and an upgrade at arrival based on availability. Quite the deal to stay at the resort rated by Travel + Leisure as the #1 resort in Mexico and #18 top hotel overall. 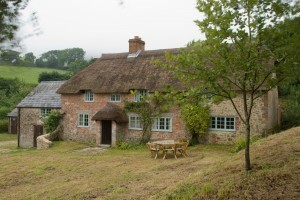 Picture bright fall foliage, stepping out into an orchard garden to collect and enjoy fresh fruit from the tree, or wandering the stunning landscape that surrounds a National Trust holiday cottage. Talk about Pilates in paradise – from November 8-14, Parrot Cay will be hosting its first Pilates retreat conducted by the resort’s own Resident Teacher, Lynda Lippin. It was planned in response to a growing demand from guests who have had the opportunity to work with Lynda over the past year and a half. Offering 16 hours of Pilates classes over the five-day period, the retreat is an opportunity to address stress areas of the body under Lynda’s expert tutelage. She has been practicing Pilates for over 20 years and teaching for 18. She trained under Romana Krfzanowska, Kathy Grant, and Eve Gentry, among others. Lippin owned and operated award-winning Pilates studios in the US, trains new Pilates teachers for the Pilates Physical Mind® Institute, and is also an accomplished fitness trainer, certified by the American Council on Exercise®. She has a strong background in sports-specific training as well as rehabilitative exercise. Think you have a dating problem?? Think again!! 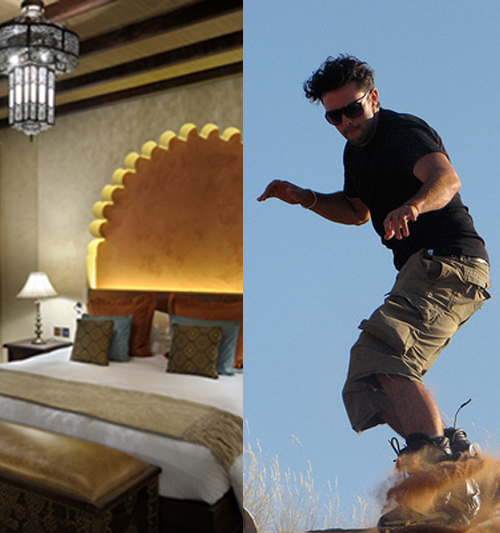 The Liwa Date Festival is one event where you are sure not to be singled out! Held annually just outside of the city of Abu Dhabi, the Liwa Date Festival pays homage to this deliciously sticky fruit and the date palm from which it hails. 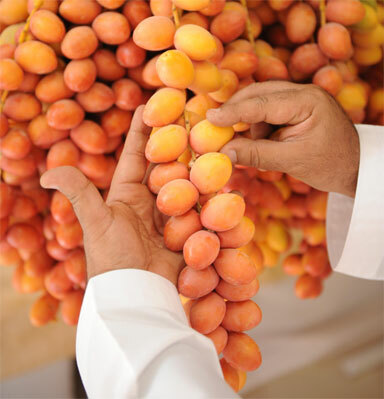 This year’s festival runs from July 17 to the 26, drawing thousands of farmers, brokers, and date fanatics alike to see the best of this year’s crop in the largest date festival in the United Arab Emirates. As part of the festivities, 140 couples are expected to be married in a group wedding on Friday, July 24, in the Liwa wedding hall. If you can’t make it to Abu Dhabi in time to get hitched at this year’s date festival, be sure to check it out next July! Etihad Airways offers non-stop service from three North American hubs (New York, Chicago, and Toronto), so getting there will be a breeze. And, be sure to shack up in the most impressive resort on the block….the soon-to-be-opened Qasr Al Sarab Desert Resort by Anantara, just a 90-minute drive from the city of Abu Dhabi. Featuring the ultimate in luxurious desert living accommodations, you’ll definitely want to check it out. No dates required. Out now in the August Issue!